Farrar, W. V. “Andrew Ure, F.R.S., and the Philosophy of Manufactures.” Notes and Records of the Royal Society of London 27.2 (1973): 299-324. Farrar conveys a very detailed biography of Andrew Ure and emphasizes his many influential contributions to the scientific community. 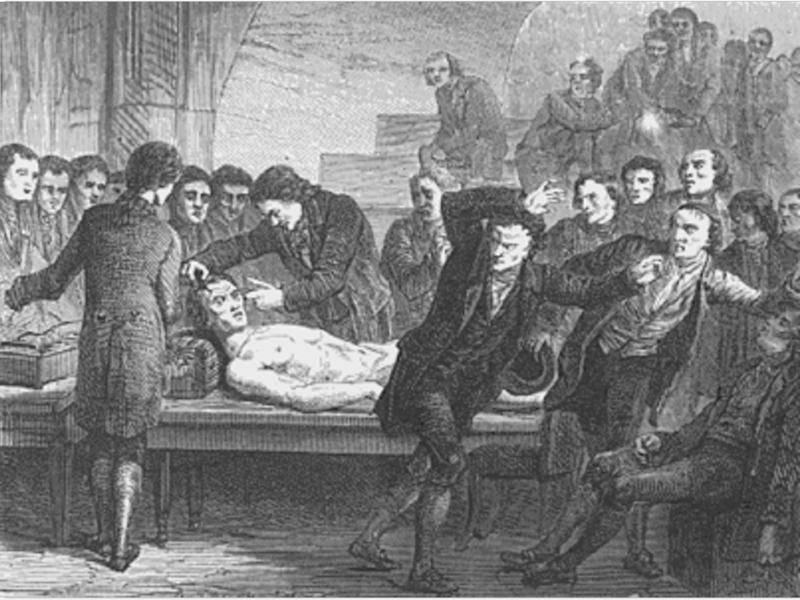 However, for the purposes of a presentation on the theory of galvanism and its connection to Mary Shelley’s Frankenstein, the paragraph that discusses Ure’s experiment in 1818 regarding the application of an electrical current to the cadaver of a recently executed criminal, Clydesdale, proves most pertinent. After connecting a “270-plate voltaic battery” to the exposed nerves of a dissected Clydesdale, Ure observed how the muscles in the cadaver’s face contorted into what appeared to be gruesome expressions, including smiles (307). Farrar also reveals that this public demonstration left many individuals terrified. Analogous to Agatha’s reaction after encountering Victor’s hideous creation in Shelley’s novel, Farrar discloses that a spectator fainted out of fear. “Galvani, Luigi.” Complete Dictionary of Scientific Biography. Vol. 5. Detroit: Charles Scribner’s Sons, 2008. 267-69. Gale Virtual Reference Library [Gale]. This excerpt from the Complete Dictionary of Scientific Biography begins with Galvani’s educational background. Studying medicine at the University of Bologna, Galvani became a skillful surgeon and anatomist. Shortly after turning his attention towards “more strictly physiological studies” and focusing his research towards the connections of an organism’s nerves and muscles, he made an unexpected discovery. 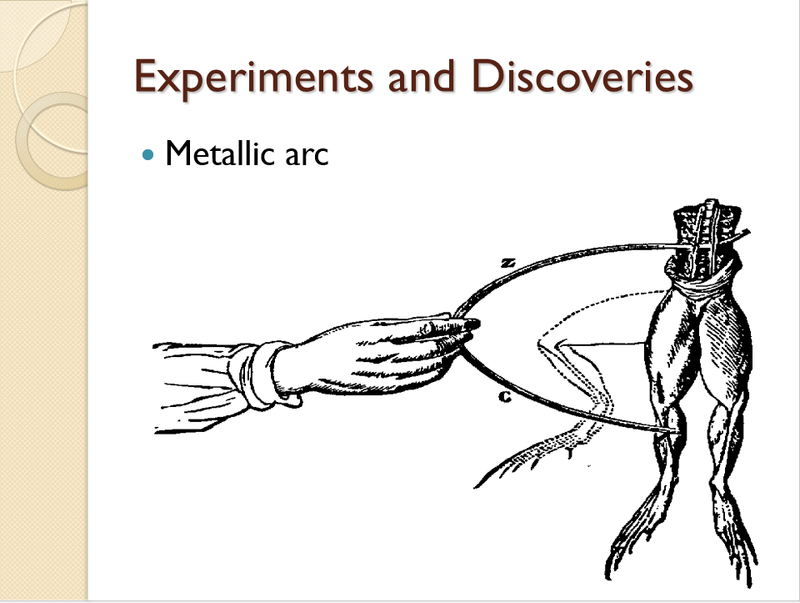 During one of Galvani’s many frog dissections, a spark of static electricity caused a frog’s leg to convulse, leading him to believe that electricity played an influential role within an organism’s tissues. 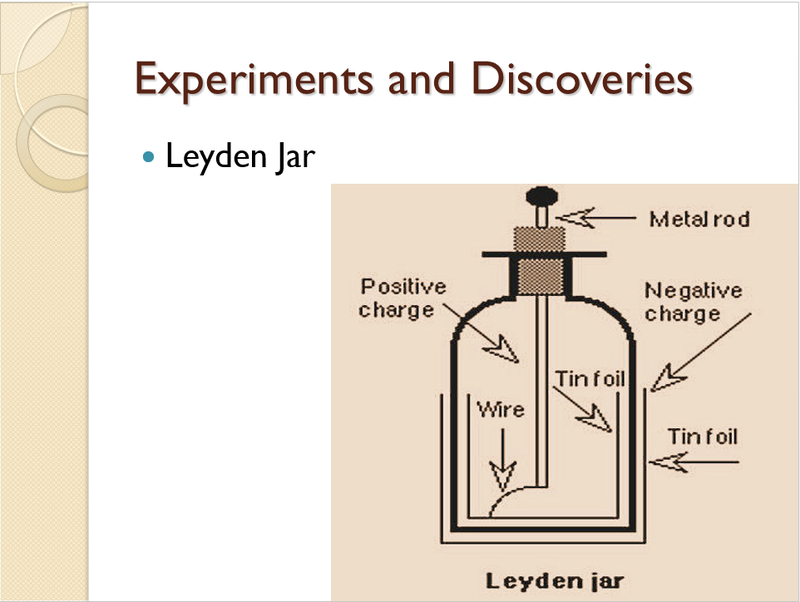 This source reveals the procedures by which Galvani conducted his experiments through the utilization of electric machines such as the Leyden jar, an electrostatic charged atmosphere, and different types of metals, conductors, and nonconductors. 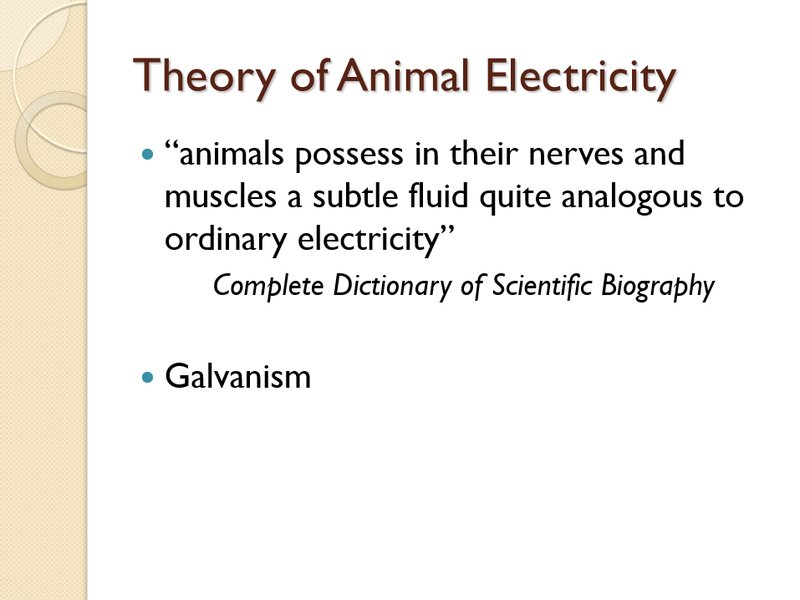 As a result, Galvani formulated his theory of animal electricity and became the pioneer of the concept of galvanism. Galvani believed that the frog’s internal tissues, nerves, and muscles produced electricity, emphasizing an animal’s internal possession of an “electric fluid.” However, this source also discusses Alessandro Volta’s opposition to Galvani’s proposition. Volta proposed that the electricity was created externally through contact of the leg with conducting metals. This idea led Volta to eventually development the first wet-cell battery. Green, Thomas. “On Death From Chloroform: Its Prevention By Galvanism.” The British Medical Journal 1.595 (1872): 551-53. Green’s descriptions of several medical cases involving the often fatal effects of early anesthetics, namely chloroform, conveys how developments in the theory of galvanism have greatly impacted and contributed to medical knowledge, technologies, and successes. A close examination of case outcomes involving both deaths and revivals reveals that galvanism has proven to be more effective than artificial respiration for its ability to restore animation, or movement, to a paralyzed and un-beating heart. Green also notes that patient outcomes are influenced by other elements, such as time. Although the application of a galvanic apparatus represents the most promising procedure, a patient’s revival depends on how fast the galvanic apparatus is administered after death. Kemp, Martin. “Shelley’s Shocks.” Nature 394.6693 (1998): 529. Kemp reveals that during the 18th century, scientific interests, research, and experiments were centered on the phenomenon of both electricity and the nature of life. 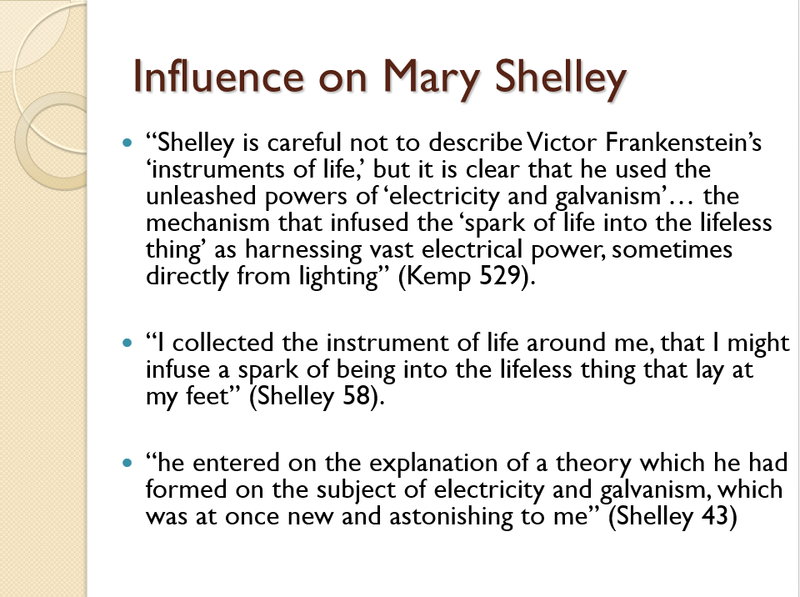 As a result, Kemp discloses that Mary Shelley’s Frankenstein, published in 1818, symbolizes a direct product of these scientific theories and discoveries as disclosed through her allusion to galvanism and concept of reanimation. This article explains how the story of Frankenstein manifested itself to Shelley in a dream after a long discussion of several “philosophical doctrines,” including galvanism, with Lord Byron and Percy Shelley. Furthermore, this article provides a brief history regarding the discovery of galvanism by Luigi Galvani as well as describes its development over the years through experiments by Karl August Weinhold, Giovanni Aldini, and Andrew Ure. Parent, André. “Giovanni Aldini (1762-1834).” Journal of Neurology 251.5 (2004): 637-38. Parent discloses that Giovanni Aldini, Luigi Galvani’s nephew, followed in his uncle’s footsteps through an academic path devoted to science as well as an interest in the relationship between electricity and muscular movement. Aldini’s desire to further advance, support, and defend Galvani’s proposition of “animal electricity,” or galvanism, lead to the development of several new theories and experiments. Together, both Galvani and Aldini proposed that the brain, when stimulated, precipitates an electric current that causes a reactive response in the muscles throughout the entire body. Parent reveals that Aldini continued to conduct experiments after Galvani’s death. Aldini discovered that the activation of targeted areas of the brain cause specific muscles to contract while others remain at rest. 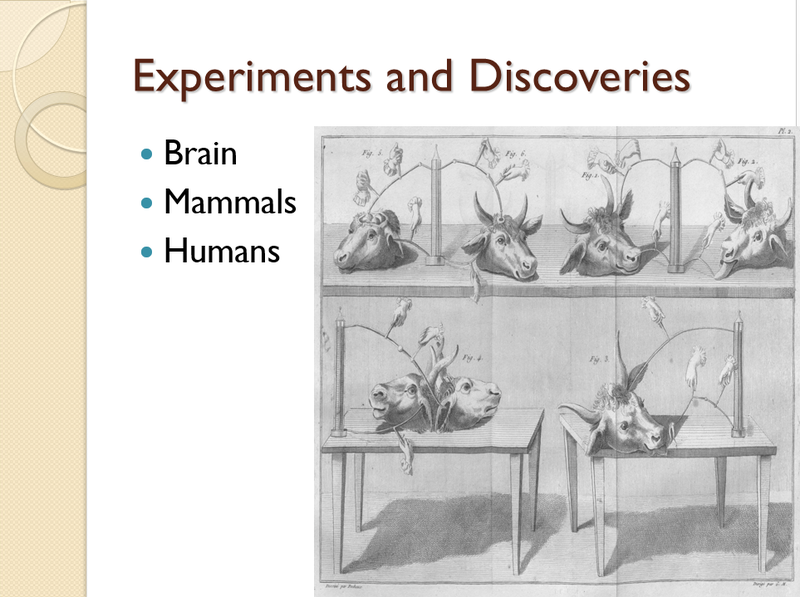 Furthermore, Aldini expanded the subjects of his experiments to include mammals as well as frogs. 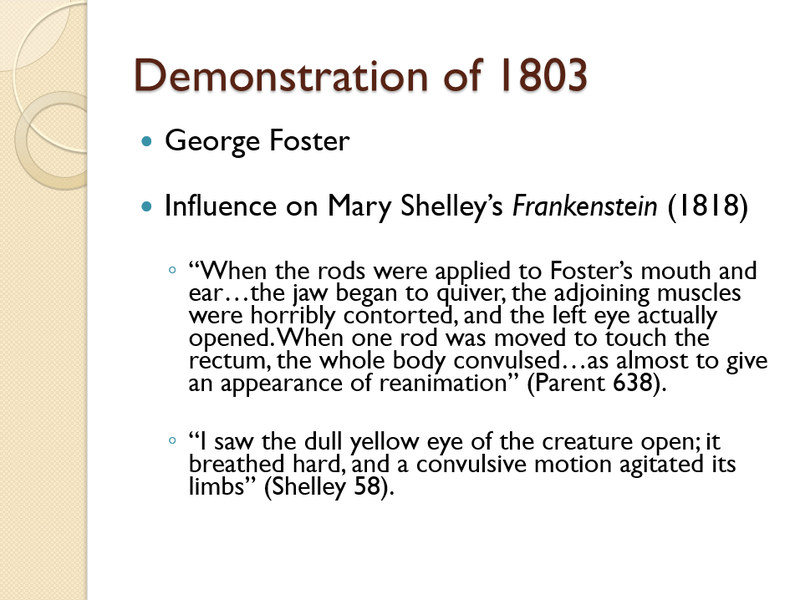 Parent describes Aldini’s experiment on the human cadaver of a criminal in 1803 to be his “most famous demonstration.” Parent’s incorporation of the description of the cadaver’s vigorous convulsions as well as the opening of an eye reveals a potential influence on Mary Shelley’s inspiration for the pivotal creation scene in her novel, Frankenstein (1818).